Stylish yet functional, our selection of door stops is perfect for adding character to your home while ensuring your doors remain open, closed, or untouched by adjacent walls. Among these are our robust skirting door stops, which are affixed to the wall or skirting board in a horizontal fashion. These fixtures make sure your doors don’t slam into the wall behind them when opened too far, and as you can see above, each of the numerous models is available in a variety of sizes and metal finishes. You can also choose between rectangular, cylindrical, or spring-based designs! 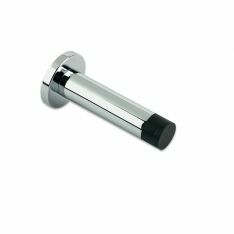 If a skirting mounted door stop isn’t for you, perhaps you’ll find something you like in our range of floor door stops – crafted with the same purpose in mind, these fixtures instead attach directly to the floor via adhesive or a screw. Unlike skirting mounted door stops, these models are generally more subtle in appearance, with a spherical shape that remains flush to the floor. Our final alternative to both of the more permanent door stoppers is our collection of door wedges. Generally formed from rubber or plastic, these can be placed in front of or behind the door to either hold a door open or prevent wall damage depending on the situation and location. This means they’re not only cheap and lightweight, but versatile and easily portable. We hope you enjoy browsing our ever-growing range of products. If you have any queries or you wish to place an order over the phone, please contact us on the telephone number at the top of the page.